After non-surgical removal of a benign breast tumor, Sandra Benevides returned immediately to her normal activities. When Fall River resident Sandra Benevides was diagnosed with a non-cancerous lump in her breast, she was happy to learn that her treatment options included cryoablation, a non-surgical outpatient procedure. Southcoast has the only breast care program in the region to offer this procedure. Non-cancerous tumors like Sandra’s, called fibroadenomas, can occur in women of any age, but are most common in those 18 to 35 years old, says surgical oncologist Maureen Chung, MD, PhD. She recommends removing them to alleviate discomfort, to keep a growing tumor from deforming the breast, or if a patient is planning pregnancy. 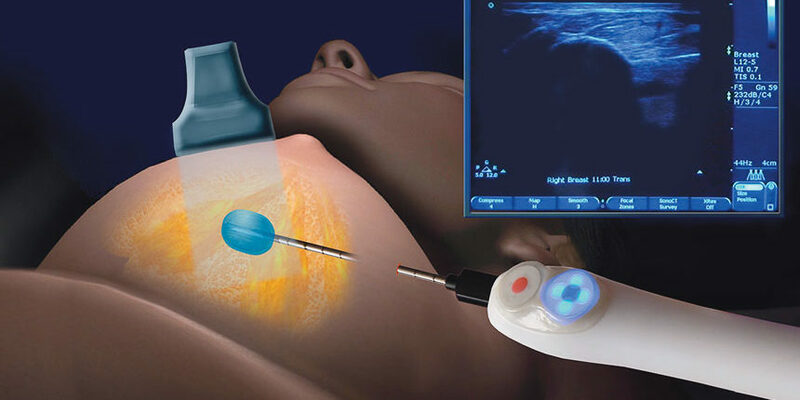 In cryoablation, which is FDA-approved, an ultrasound-guided probe is inserted into the fibroadenoma through a tiny incision. The probe freezes the tumor, which is then gradually reabsorbed into the body. Sandra adds that she felt little discomfort. “It was mostly pressure, nothing that I couldn’t tolerate.” Some initial swelling and soreness was easily alleviated with over-the-counter pain relievers and gone within two days, she adds.